We understand that as an Eyecare Professional a main concern is to help your patients protect their eyes and keep them healthy. As you might know, Age-Related Macular Degeneration (AMD) affects millions of adults every year and it’s the leading cause of blindness in people 60 and older. To help patients with AMD, the ECP chooses from a variety of supplements available in the market. Unfortunately, these products can be purchased anywhere: on the web, big-box stores, or pharmacies. 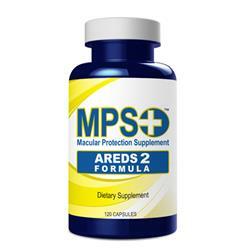 To help you retain these sales, we now offer MPS+™ AREDS 2 Formula, which is ONLY available to patients through YOU – their trusted ECP. This trusted formula is based on the Age-Related Eye Disease Study 2 (AREDS 2), which is a 5-year clinical study completed by the National Eye Institute (NEI) in 2013. The main nutrients are Lutein, Zeaxanthin, Vitamins C & E, Zinc, and Copper. Offer your patients a trusted and affordable eye supplement TODAY! For more information call us at 1-800-678-4768 or visit our website. Use Promo Code MPS20 and receive 20% off the list price; offer expires soon.